The Coloplast Self-Cath Olive Tip Coude Catheter family of latex-free catheters from Coloplast offers patients a variety of options for intermittent self-catheterization. Each Coloplast catheter is made with the highest quality standards dedicated to patient co1mfort and ease of use. 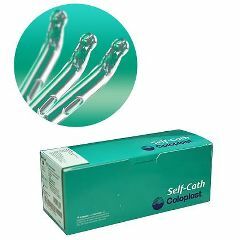 The Coloplast Self-Cath Olive Tip Coude Catheter is 100% latex-free with fire-polished eyelets and a siliconized surface for smooth insertion. This catheter features a Guide Stripe which assures proper placement of the angled coude tip. Lightweight. helps people with urinary. due to urinary problems I have to use this catheter and since my insurance wont pay for enough for a month I have to buy 4 boxes each month. I really depend on Allegro's 60% sale and the fact that their shipping is so fast. No medical issue with it. Only catheter I can use, never had any problems. Just wish they were not so expensive or after you buy so many you could get a box free. For someone on a fixed income and this being the only catheter I can use due to medical necessity it truly is a costly supply. This catheter didn't work for me. It is not as flexible as I hoped and there was much pain when trying to use it. I bought a 14 French of this brand and to compare I also purchased a 16 French Bard Coude Tip Tiemann catheter. The 16 French of the other brand was significantly more comfortable to use even at a higher diameter. On the plus side, this brand is cheap, so if sensitivity is not an issue, this may work for you. It goes without saying that you should try ONE first before you buy a large quantity of it. I've been using this product for 6 years - works fine for me. I'm anxiously waiting to see if Medicare approves my claim for reimbursement. Product is easy to use--was able to get the appropriate size. Do you work with Blue Cross Blue Shield for reimbursement? Have used the Coloplast coude for about a month. About one of four doesn't pass into bladder. I know it's aligned properly since I've used another brand for about two years. Really like the Coloplast, but can't afford the one I have to throw away. Anyone else have this problem? Any suggestions? Plan to try additional lubrication jelly, and see what happens. Works well for me. How do you clean and store? Store flat...I made a container from 1 inch PVC filled with isopropyl alcohol. How long can the expiry date last? Can it last for as least 2 years when we recieve the goods? CAN BE UPTO 4 YEARS, LOOK ON YOUR BOX OR CATH STRIP FOR EX DATE. can this catheter be used multiple times? I've reused these fine catheters hundreds of times, since I pay for them myself. I store it in a large jar with a bit of chlorine bleach, just enough to smell like bleach. Then I rinse it in hot water before using, to clean it and to soften it up. Yes, it can be used for multiple times as long as you take care of it clean and hygien. Below are my practice: I use 1 catheter for 2 months normally. After I done my CISC (Clean Intermittent Self Catheterization), I wash the catheter with water and normal soap. After that I soak it in a 1 liter of sterilizing water container for 30 minutes. At last, take it our and dry it with clean towel and keep it inside a container for preparing for next use. Hope that my instruction helps you. Thank you. Yes, as long as you sterilize between uses. I use diluted povidone iodine. YES I follow my Dr's instructions on clean procedures and have very few problems. I use them repeatedly. My urologist says no problem as long as I keep them sterile. Yes, you can reuse them. Wash with soap and water after use and hold under faucet running water inside to rinse. Wrap in a clean piece of paper towel. (Make sure you're not allergic to any chemicals in that brand of paper towel. Caused bladder infection for me once, years ago.) The environments outside and inside the body are different, same bacteria can't live outside and inside, so there's not much to worry about. Use each catheter 2 or 3 weeks, depending on climate - shorter if warmer. Examine before use and discard immediately at signs of any specks of gunk on the inside. They are inteded for single use. My doctor prescribed these for multiple use. I have used some in excess of 30 times. These are meant to be reused, but are not sterile. I have a stoma and internal pouch, so I don't need a sterile catheter. I reuse them so often that it takes me 6-9 months to go through a box of them. I use a bulb syringe and warm, soapy water to clean them (I use dishwashing liquid), as was recommended by my ostomy nurse.